Like the rest of the population, the mental health of people with intellectual disabilities is best understood in a much wider context of their general well-being, their supports and networks, their family and social setting and the broader aspects of the society that have significant impacts on their health and health inequalities. Trauma and stressful life events, poverty, unemployment, housing insecurity, social isolation and loneliness, discrimination and inequality are all factors associated not only with individuals with intellectual disabilities and autism but within their families. Resilience and recovery depend in part on being part of a supportive and containing community. Co-organised by AMPANS and ALTHAIA with the support of ARFIE, the Congress will bring together current knowledge and expertise in this wider context, looking at how people with intellectual disabilities, their families and their social and professional networks all have important experience and skills to contribute and share in creating and developing effective, collaborative and co-productive models for understanding and promoting mental wellbeing. 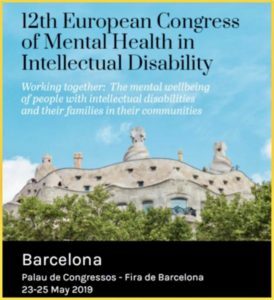 In addition to invited keynote presentations and focused communications the 12th Congress of the European Association for Mental Health in Intellectual Disability will offer researchers, scholars, professionals and others from the field a number of formats for presenting and discussing their recent work. Formats will include solicited and co-productive symposia, individual presentations and round-table discussions as well as poster presentations. Click here to know more.